Central Florida’s Baytree golf course, with a clubhouse and 18 holes, in Tavares is on track to become a subdivision. The closed course at 129 Juniper Way sold this week for less than half the $1.1 million original asking price. The $500,000 final price also was less than the $792,000 that previous owners paid for it in 2010, records show. "The people who just sold it did their best to maintain it," said Crosby & Associates’ Richard Gonzalez, who brokered the sale. "The fees were $20 for a round and when they raised it to $25, people just went berserk." Last year, residents of the Baytree Villas community urged Tavares to buy the course with the opes it could become a “first-class facility.” The greens and fairways are the latest among a series that have closed in Central Florida in recent years. They include: Rock Springs Ridge in Apopka, Sabal Point in Longwood, and Rolling Hills in Altamonte Springs. Saddled with taxes, maintenance and code fees, Baytree’s previous ownership group "did not make money on it," Gonzalez said. The property had been owned by a group that included Tavares residents Michael Wert, William Lamm and Sheryl Klein, state records show. County records show the buyers were Tavares-area residents Wallis Guy Owens and Karen Mabel Owens. 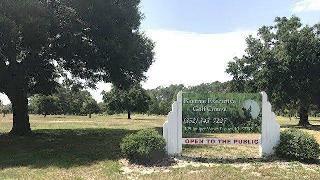 The homeowner association at Baytree Villas has asked the city of Tavares buy the golf course at their development and run it as a "first rate facility." The 89-acre property is about a quarter wetlands and has entitlements for 118 units, Gonzalez added. The surrounding community is mostly single-family homes with some townhomes in the mix. Gonzalez said a new development could possibly include a smaller nine-hole course but that’s all uncertain at this point. The golf course was first listed about a year ago and a national builder had the property under contract within a few months but did not complete the sale.